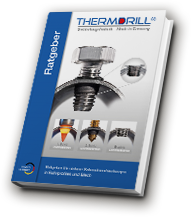 Thermdrill® process – The solution for wobbly rivet nuts! Every metal worker knows the problem that comes along with rivet nuts. They can get wobbly or loose especially when it is used for connections with dynamic load or vibrations. These type of connections are not only time consuming but also cause high costs for rejects or complaints by customers. As a manufacturer of thermal drills made out of solid carbide – also known as flowdrill – we are providing a genuine alternative to inserts like rivet nuts, weld nuts or similar inserts. The Thermdrill® process is an amazingly simple and extremely cost-effective method to produce solid and wobbly-free screw connections. Yes, I´m interested in solid screw connections for low wall- thicknesses! Please send me your Guidebook. The so-called Thermdrill – also known as a flowdrill – is used like a conventional spiral drill. While thermal drilling or flow drilling, no chips are produced. The existing material is displaced and formed into a bushing by means of friction heat. All standard threads availble metric M3 to M20, pipe threads etc.